Toxicity thrives when no one tells the truth, but the reverse is also true. If your employees are honest about each other, they can uncover toxic conduct and destroy it. Employees know how obnoxious leaders can be, but reporting their actions isn’t always worth the effort. Not only do toxic people seek revenge, but they also love destroying communication lines. That makes it easier for them to isolate coworkers so they can emotionally manipulate them. If you want your employees to tell the truth, then you need to reward them. Speaking against a colleague is always risky, especially if they are voicing criticism a superior with the authority or influence to punish them. You don’t have to offer monetary incentives; praising them in private is usually enough, though it doesn’t hurt to remind them that you will remember their thoughtfulness when you are writing schedules and planning promotions. People won’t correct their conduct if they don’t get clear directions. Procrastinating is easy, and having no deadlines means they are getting away with their toxicity. Troublesome managers don’t always make destructive decisions intentionally. Micromanagers, for example, want to do a good job and work hard; they just don’t understand that they are wasting company time. Create deadlines that your employees can meet. Breaking them down into small steps means everyone can follow their progress and make needed adjustments. It is also a good idea to clarify offenses and punishments. Some actions deserve swift and harsh penalties, including firing; informing your employees is a powerful deterrent. Knowing when to let members of your leadership team go is vital. Managers influence decisions at every level of your business, including who you hire and fire. Toxic personalities hire job candidates that look like themselves, poisoning your business over time. Don’t let them get away with it. Only the future matters. The resources you spent on recruiting and mentoring a team member are already gone. You are losing money and damaging your reputation every day a toxic leader stays on staff. You should include all compensation in your calculations, of course, but always make decisions that will help your company in the long term. In business, character matters. Creating policies that prevent toxic behavior is vital, but people are infinitely creative. Given enough time, people will bypass the system, even if it means bribing and blackmailing coworkers. Hiring and promoting employees with strong character will transform a corrupt leadership team, as long as they are free to influence their coworkers. If you think toxicity is in a specific level of your command structure, attack it from above. This simple solution often leads to quick results. You will face stiff resistance, but it will weaken over time as toxic influences lose power. But what character traits should you seek? Emotional maturity will stand out; it is hard to miss in an employee’s actions and work history. Next, look for candidates who value people over possessions. If someone would prefer to walk away from a toxic culture than become part of it, they might be a perfect fit for your team. 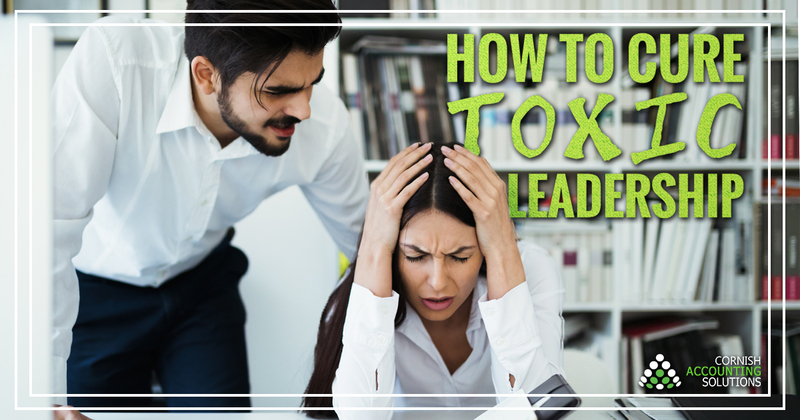 If toxic leaders are poisoning your business, then look for a cure; finding one is not as difficult as many companies may think. Toxic personalities aren’t immortal, and some aren’t even aware how destructive they are. Give them the opportunity to change. If you would like tailored business advice that can respond to the needs, challenges and opportunities of your business, give us a call. We’re more than just accountants.